At Croom we offer an extensive range of high quality precast concrete box culverts, and the applications for which they are being used is growing as word of their simplicity, ease and speed of installation and cost-effectiveness spreads. Croom has supplied culverts for major civil engineering programmes, for agriculture, and for small individual projects. Every culvert is tailor-made for the client, and our expertise and experience has proved to be of huge benefit to our customers. We offer a comprehensive ‘turnkey’ service for every stage of the project, from obtaining planning permission through design and installation up to completion and finishing. Road Crossings. Safety is the most important factor in most road crossings, and culverts, by creating a complete separation between vehicles and pedestrians or livestock, offers the best possible solution to the problem of road safety. Because they are quick and easy to install, disruption when replacing an existing crossing method is minimised, as is expense. Culverts can be used as underpasses for pedestrians, cattle, and vehicles, including large agricultural machines. Wildlife corridors. These are growing in importance as ecological considerations take force in planning, and box culverts under roads, railways and other infrastructure systems are ideal for this purpose, answering the demand without greatly increasing the cost to the project. Balancing Tanks. With climate change and the resultant fluctuations in weather conditions, storm water balancing tanks are being used in an increasing number of applications as planners need to take flood risk into consideration. Single culverts, or, where large volumes of water may need to be stored, a span of several culverts, offer an economical and effective storage solution. Stream Culverts. Architects and designers need a means of channelling streams under or through structures without reducing or otherwise interfering with the use of space of buildings. 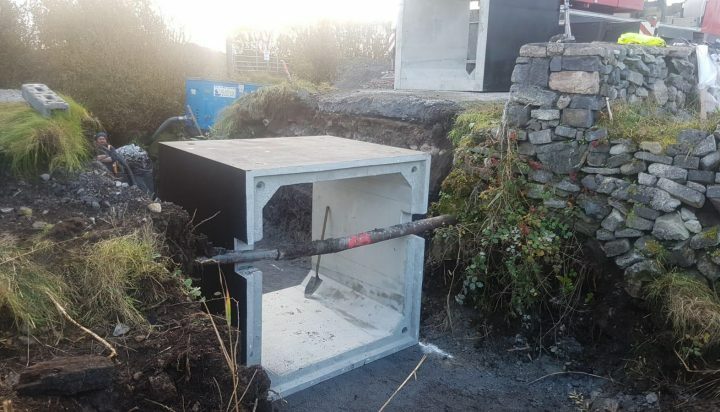 Box culverts offer an ideal solution to the problem, allowing the water to pass safely through or under their developments. Multi Cell. Where there is a demand for a high capacity, where heavy flow is anticipated, box culverts are ideal, and they can be laid down side by side. If necessary, a series of multi-cell culvert installations can be used, allowing a greatly increased flow and in some cases pre-empting the need for later work should the demand be found to have increased. Pipe Replacement. The simplicity of box culverts when compared to concrete pipes makes them an excellent alternative when pipes need to be replaced. They still provide excellent drainage, they are very durable, and, where finished levels have tight constraints, they offer many advantages over traditional pipe work. Tunnels. Service or escape tunnels, or pedestrian subways are most easily designed and constructed when precast concrete culverts are used. They are simple and easy to install, and they provide a safe and strong underground passage. Shafts. Installed vertically, box culverts can be used to create access shafts. They are strong and durable, and they can resist very high pressures. Strength and durability. Croom Concrete’s box culverts are designed to withstand high pressure, and to outlast other systems. Special consideration has been given to the withstanding of pressure from heavy loads passing over the culverts, and Croom Concrete’s designers ensured that the culverts would be ideal for this purpose. They are not vulnerable to corrosion. Sturdy, high quality construction ensures a long-term service life. Cost effectiveness. Speed and ease of installation cuts labour costs and minimises down-time or access problems. Simplicity of design and construction cuts future disruption for maintenance. Croom Concrete’s box culverts encompass widths of 1000 – 6000 mm and heights of 600 mm – 4000 mm. Croom has a modular mould range, which allows us to offer many possible combinations. Custom inverts and channels are available on request; standard models come with flat inverts. Please note that special inverts are built up from smaller moulds; therefore the shallowest dry weather flow channel available would be 750 mm, and the shallowest shallow V invert would be 675 mm. The internal height of a special unit is measured from the base of the invert. Units can be supplied tapered to enable bends in culvert runs, typically no more than 10° per unit. Manhole openings and pipe access holes can be produced on request, and runs can be capped with an integral end wall to form a tank. Channel units are also available. Every culvert is individually designed and manufactured. All our products fulfil the requirements of BS 5400 and BD 31/87.